A client asked me to sign up for this race with her. We trained together, and good thing, because I wouldn't have run much if I hadn't had the accountability of a fellow athlete. She said she would have balked at the last minute if I hadn't agreed to go. Good thing we had each other. Several days before the event, the race organizers sent out an e-mail warning of dangerously low race-day temperatures in the St. Louis forecast. They made changes to the start times and start orders, and warned of temperatures barely above 0* F. I dislike running in anything below 16*, taking into account wind chill and all. Besides which, I'd blown off my last two weeks of training, and wasn't feeling very enthusiastic about running 9.3 miles. My enthusiasm waned further after a few hours worth of snow and sleet accumulated the Friday night before the Sunday race. We had planned to leave from Chillicothe around noon on Saturday. Since it took nearly twice as long as usual for me to drive from Jamesport to Chillicothe, we didn't leave until closer to 1, and the drive to St. Louis was harrying and dangerous. Since there was no race-day packet pick-up and we were running terribly late, we asked a friend to pick up our race numbers and goodie bags from the expo. Race morning wasn't nearly as cold as I had expected, primarily due to a lack of wind. I dressed for super cold weather, though: thermal tights, t-shirt, arm warmers, fleece cycling coat, two pairs of socks, wind-proof gloves, hat, and ninja mask. I lined up in Corral A feeling profoundly out-of-place. I seeded myself at a 9:00/mile pace, wildly exaggerating my own ability. I found myself surrounded not only by the runners who think they're fast (you know who I'm talking about), but by the the ones who actually are. I, in contrast, am not fast. Especially this year. I am slow. Painfully so. The race started, and other runners streamed past me for the first two miles. After that, the streaming was slower, but still consistent. I ran slowly, allowing my body to warm into the distance. After the first half mile, the road sloped steadily up. That's where my feet and calves started hurting. By the top of the hill, about a mile in, I had already pulled down my running mask and peeled off my jacket. In the next mile, my hip flexors started talking. After 2.8 miles, the 5k and 15k courses split. I seriously considered taking the shorter, less painful path; my body was already screaming for me to stop. But I gritted my teeth, and kept left at the fork for the full 15k. Towards the end of mile 4, I pulled down my arm warmers and yanked off my hat. I was running in tights and a T-shirt, my jacket tied around my waist like a fit Kurt Cobain. I'd badly overdressed. The coat, with my arm warmers and gloves zipped into the pockets was heavy and unwieldy, and contributing to the spasms in my hips. I usually get a second wind during miles 5-7, but in this race, it lasted from mile 5 to mile 5.5. Mile 6 was a long, steady, unending climb. That's where I started mentally swearing, and where I took a few walking breaks to let my hip flexors unwind. The race became mentally easier after that long uphill; I realized that I would hurt just as much running slowly as running fast, so I may as well get through the pain as quickly as possible. That thought kept me going until the last mile, when my body almost shut down. My hip flexors and calves cramped so badly that I could barely keep moving forward. I shuffled my feet off and on, fighting through the pain on the last hill, then pushed hard for the last quarter mile, crossing the final timing mats and staggering to a stop. With cessation of movement, my body immediately cramped, and I started getting cold. I grabbed a bottle of water and a cup of Gatorade while I waited for my friends to cross the line. After the race, we got souvenir bowls that held a cup of hot cocoa, a well of melted chocolate, and some snacks for dipping. I drank the hot cocoa as we started our walk back to the hotel (we stayed within walking distance of the start and finish lines to avoid traffic and parking issues the day of). By the time I got back to the hotel room. My chocolate had frozen solid. It was still delicious, though; I dug it out with my pocket knife one bite at a time. I took a shower, and the hot water washed away the remaining muscle spasms. I'm not sure what caused me to cramp like that; it was probably a combination of the cold weather and hilly course. Whatever it was, I haven't hurt that badly while working out since . . . I don't know. At the time, I was convinced that I'd never experienced such pain. But you know how that goes. I probably think that at some point during every race. I'd never done a 15k before, so I can proudly claim that I set a new PR at this race. I got a cool sweater in my goodie bag. Also, CHOCOLATE! 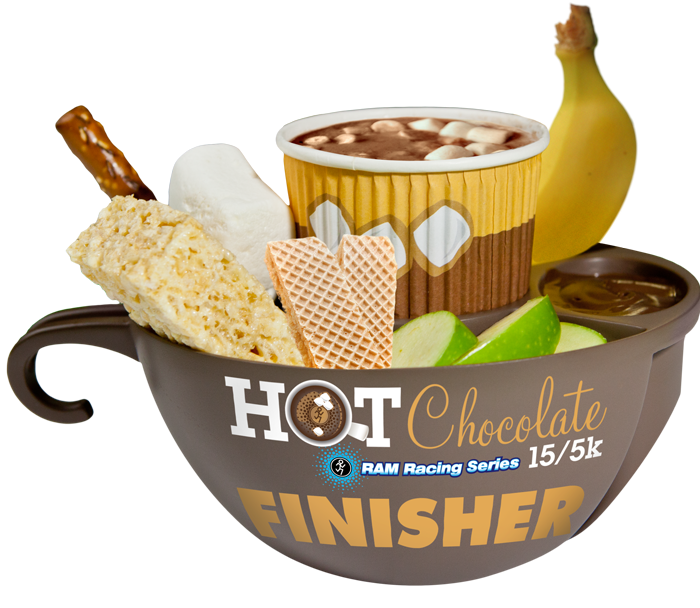 Chocolate is a great reason to do any race. I'm sure if I had received an e-mail telling me about dangerously low temperatures I would've also overdressed.